I'm a big fan of sun protection, given that I have had more than a few atypical moles grace my body over the years. Several removed as well. Let's just say I am a lot more serious about wearing sunscreen now. I have a pretty pale complexion, so it's important that I do what I can to shield myself for safety let alone anti-aging purposes. What better way to get extra protection than with a cute sun hat! This Cappelli Straworld Pack a Hat is in natural black. It's a bit big on me so I use it to my advantage when I'm reading or just sitting around where i'm going to be in the sun. It's got the perfect coverage for that and I don't really need sunglasses. This isn't an ordinary sun hat though folks, it's got a UPF 50+rating of protection. No sun is infiltrating through this guy within it's 4 ½ inch brim. It comes in a cute lil matching wristlet tote, making it convenient to pull out whenever you need more protection. Also great for when you don't have enough room in your bag, you can just wear on your wrist. It's big enough to hold the sun hat and a few other things, so it's perfect to bring to the beach or on a long walk. This sun hat is thick, but it's got a floppiness with structure. That will make more sense when you feel it, trust me. You can shape it any way you want. I think the ridged texture adds a lot of appeal to the design and it doesn't feel the least bit heavy on. The zip up tote is quite roomy at 9 ½” w x 7”. It has a comfortable faux leather tan wristlet and the signature wooden Cappelli Straworld logo on the top. I've gotten a lot of use out of the Pack a Hat lately. 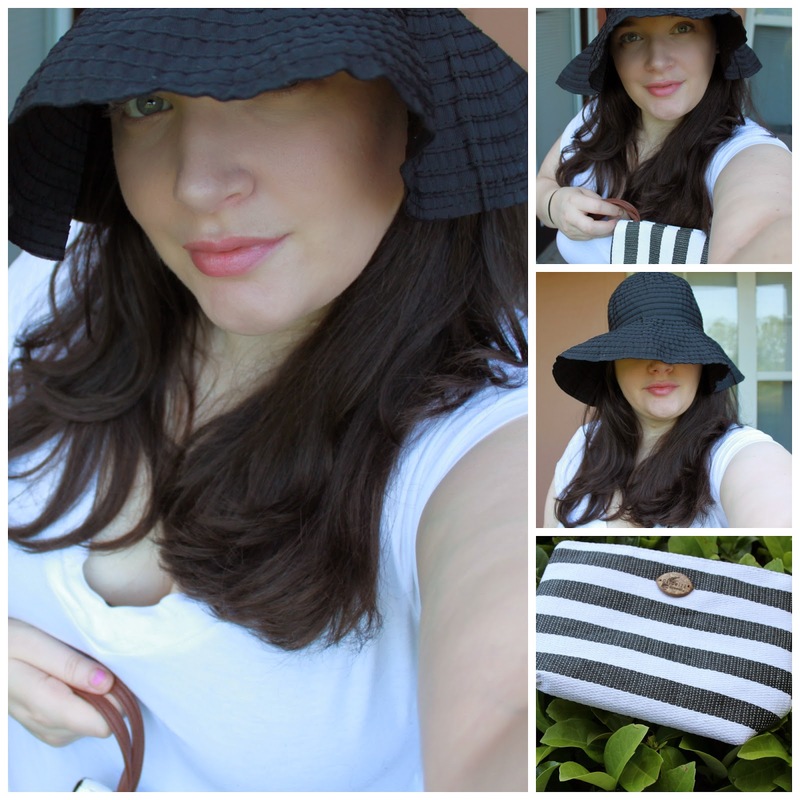 I carry it around with me on walks and it easily fits the sun hat, sun glasses and my keys. The best part about the sun hat is that you can bunch and roll it up as much as you want and it will never come out wrinkled looking. The Pack a Hat comes in 7 different striped versions: black, red, navy, green, lime, turquoise and you can purchase it for $25. Make sure to measure your head to get the right size, as they run big in my experience!